Urban Courtyardism begins by asking, "What is the quality of courtyards and what is the system of their fabrication to make urban spaces? How do we sustain qualities of such building type facing challenge and must transform, and how do they provide the capacity to sustain continuity and at the same time facilitates new possibilities? " By looking into three-dimensional systems for multi-leveled courtyard spaces, the works by Wang Weijen explore how to re-invent the historical typology for contemporary urban conditions when density and height has to be increased. Through a series intervention of courtyard typology designed with their landscape and social fabrics, they also open a new narrative courtyardism for the urban-rural conditions in Asia facing challenges of density, sustainability and identity for communities. Award-winning architect Professor Weijen Wang shows how architectural design can address challenging social and ecological issues in rapidly urbanizing areas. 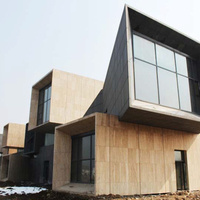 He creates innovative architecture related to traditional models in Hong Kong and mainland China. With a practice that extends from megacity towers to rural villages, he tailors his contemporary design to the cultural and ecological setting. Because Wang has studied and worked in the US, Taiwan, and China, he can translate architectural trends and cross-cultural solutions to a diverse audience. Wang Weijen is a Professor in the Department of Architecture at the University of Hong Kong who holds degrees from UC-Berkeley and Taiwan University. His research mainly focuses on Chinese architecture and cities, including the transformation of courtyard typology, urban fabric and public space in historical and contemporary Chinese cities, and the typology of the Chinese temple. Recent publications include Refabricating Cities: A Reflection (2010), Re-generating Patio: Study of Macau Historical Urban Fabric (2011), a special issue of Taiwan Architect (185; 2011), and UED (053), “Urban Courtyardism: Design Works by Wang Weijen”, also in 2011. His architectural design projects have won several AIA Design Awards, a World Architecture News Award, a Far Eastern Architectural Award, as well as a Green Building Award and an HKIA Award.